The impact of the Great Recession that started in 2008 was wide reaching. Not only were markets rattled, but certain industries saw immense growth as investors looked for alternative ways to protect their wealth. Precious metal coin and bar production saw historic increases in production as collectors and investors alike sought out silver and gold as a means of securing their hard-earned money. 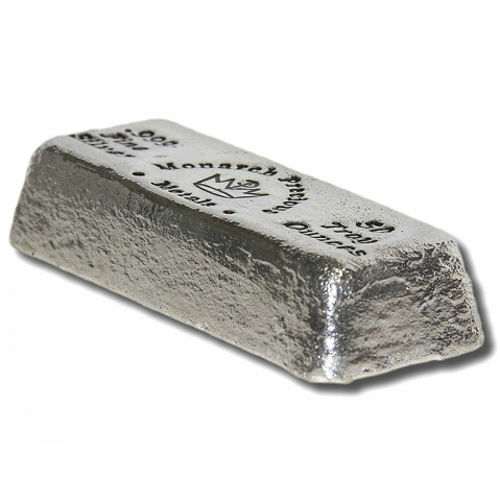 Today, Silver.com offers the 50 oz Silver Monarch Hand Poured Loaf Bar for purchase. Brand-new product from Monarch now available on Silver.com! Consists of fifty troy ounces of .999 fine silver. Bears the Monarch Precious Metals logo. Rustic appearance and rough finish courtesy of hand-poured production. Created in the United States at a private minting facility. There are numerous ways that mints can produce silver and gold bars. Currently, the most popular methods are cast and minted ingots. You can easily tell the difference between the two in many cases because minted ingots are mass produced with the aid of advanced technology, allowing refineries to produce a finished product with fine lines, sharp edges, and intricate designs. Cast bars are partly produced with machines, but involve pouring melted silver or gold into a molded cast and allowing the product to cool before markings are stamped into the surface of the bar. Monarch Precious Metals takes this approach one step further, or backward into history if you prefer, by hand pouring all of its loaf silver bars. 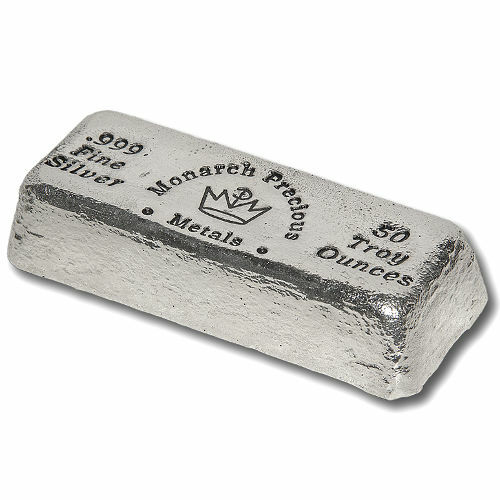 The 50 oz Silver Monarch Loaf Bars available in this Silver.com product listing are hand-poured by the refinery, and feature stamped markings on the obverse only. 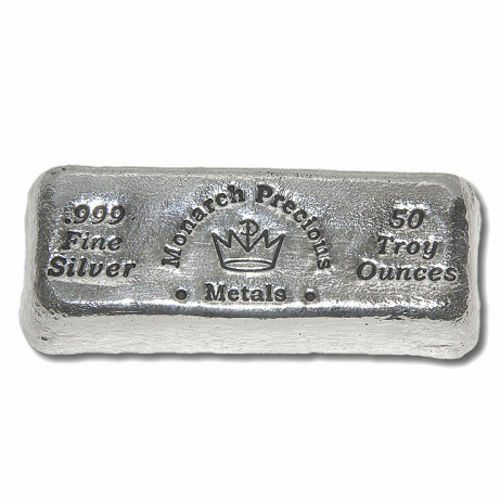 These markings include the purity and metal content of the bar, the Monarch Precious Metals logo in the center, and the bar’s weight in troy ounces on the right. Monarch Precious Metals hand pours all of its silver and gold loaf bars, and stamps each of its products rather than laser engraving. Founded in 2008, this private mint is located in the Rogue Valley of southern Oregon. If you have any questions, we encourage you to reach out to us at Silver.com. Our associates are available on the phone at 888-989-7223, online using our hosted live web chat, or via email address. If you are interested in similar products, check out our selection of 50 oz Silver Bars.